How Should My Role in a Wedding Influence the Speech I Say? If you are going to be giving a speech at a wedding reception in the near future, you might have begun putting it together recently. If you will be giving a wedding speech for the very first time in your life, you might be somewhat confused about what bits of information to include in it. This article contains lots of details about giving the best possible speech at a wedding reception. 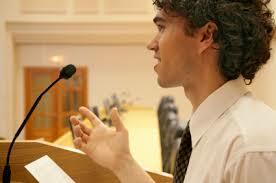 It is important for you to realize that not all wedding speeches are the same. As you look through the next few paragraphs, you will see what talking points should be mentioned during a best man speech, a father of the bride speech, and a groom speech; these speeches tend to be given during the course of all wedding receptions. If, however, you would like to cut one or more of these talks at your own wedding, you certainly can! 1. The father of the bride traditionally gives the first speech during the reception. First, he ought to sincerely thank all of the individuals who made the trip to be in attendance. Next, the father of the bride should thank all of the parties, himself excluded, who gave monetarily so the wedding could take place. The father of the bride should also say something kind about his daughter’s appearance on her wedding day. He should then welcome his new son-in-law into his family and toast the new couple. 2. At today’s wedding receptions, it is common for the groom to offers a speech as soon as the father of the bride sits down. The groom ought to thank his father-in-law for his words, then thank the guests for coming to celebrate with him and his new bride. The groom should say something funny regarding his best man before telling him thank you for performing so many duties. This wedding speech should conclude with a toast to the bridesmaids and the maid of honor. 3. Most of the time, the best man speech is slightly less somber than the others; he can feel free to include multiple amusing stories. This wedding speech, though, still needs to conclude seriously. The best man needs to make sure he tells the bride and groom how happy he is to see them embark on this new chapter together. Whatever sort of speech you are required to give at the wedding, you might find yourself having some difficulty composing it. If this happens to you, you might want to visit a professional speech writing service.